Colossal reggae rock legends, Slightly Stoopid, is venturing out from their sunny SoCal homes to take on the nation all summer long in their impressive School’s Out For Summer Tour. Performing 43 shows in 28 states is quite a feat in itself, not to mention the monumental direct support attached to the bill – crowd-favorite Stick Figure and those crazy Pepper boys. 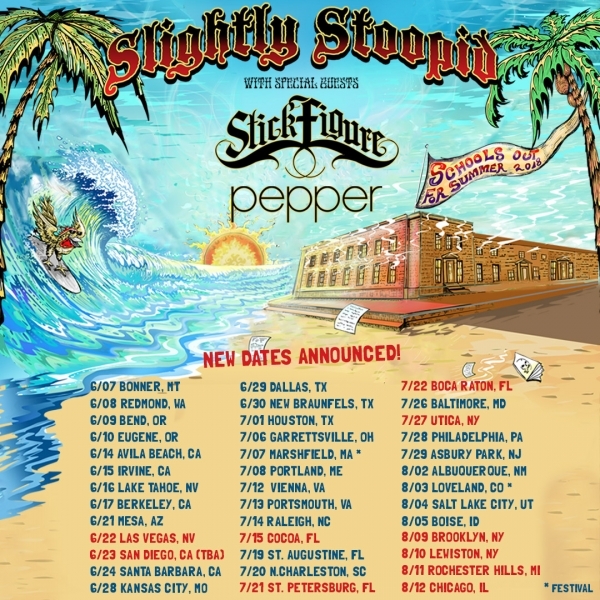 Between Slightly Stoopid's mega hits, Stick Figure's smiling stage presence and Pepper's comedic, rockin' rage of a set, summer 2018 just got EPIC. ...school’s out for summer and Slightly Stoopid is supplying the party. Just as May Gray hits heavily upon Stoopid’s hometown of Ocean Beach, California, the boys kick off their tour at Hangout Music Festival in Gulf Shores, Alabama May 20th. Not long after, the tour doubles back for a pitstop at the mother of all reggae-rock music festivals, California Roots in Monterey, California on May 27th. Winding back and forth from coast to coast, the School’s Out For Summer Tour plays amphitheater after amphitheater, with several more multi-day music festivals thrown in the mix like Wisconsin’s Summerfest (14 days of music!) 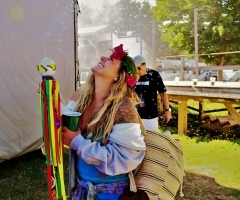 on July 5th or the 4th Annual Levitate Music Fest in Marshfield, MA on July 7th. 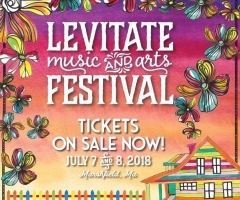 New Englanders, if you haven’t secured your tickets for Levitate yet, you may want to do so fast! The complete lineup consists of Trey Anastasio Band, Rebelution, Stephen Marley and more, making this east coast fest one you don't want to miss. And, San Diego, don’t worry: the Stoopid boys do happen to have a hometown show on the itinerary and lucky for you, it goes well beyond the normal Chula Vista amphitheater ways. 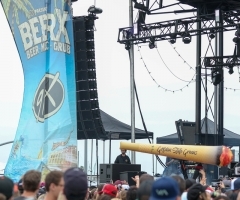 Alt radio station 91x presents BeerX smack dab in the middle of downtown San Diego at the Embarcadero’s Waterfront Park, featuring not only Stoopid, Stick and Pepper, but also Fishbone, Ethan Tucker and Marujah too. If your brain didn’t just explode, just wait until you attend that insanely diverse and talented lineup! And, lest we forget, this pack of wily boys are stopping at Loveland, Colorado’s ARISE Music Festival on August 3rd, a festival that is indeed the biggest reggae sensation in the entire state. Let’s bust out the shades, the beers, the beach towels and the buds – school’s out for summer and Slightly Stoopid is supplying the party. Just like all things in life, everything must come to an end – including this tour. 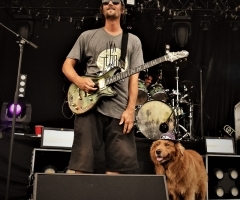 Ending August, 12th in Chicago’s Huntington Bank Pavilion at Northerly Island, Slightly Stoopid, Stick Figure and Pepper perform their finale show to the Midwest masses. For members of the Stoopidheads following, or for those who want to upgrade their experience at any show, the Stoopidhead VIP Package includes not only a ticket, but also a backpack, a foil poster, a beach towel, a koozie, a collectable wristband, an exclusive merch item, premium viewing areas and early entry (when applicable). Slightly Stoopid wants to make your concert memorable, so opt for this complete beach care package for the full endless summer extravaganza. Tickets, as well as VIP options, are now available for purchase through any venue, festival or through www.slightlystoopid.com. Don't forget to hashtag your concert selfies with #SchoolsOutForSummer2018!